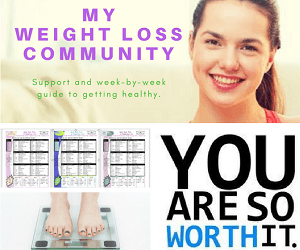 Lose weight on 1400 calories per day! This plan is for both men and women that need to lose weight or change their eating habits to a healthier plan. 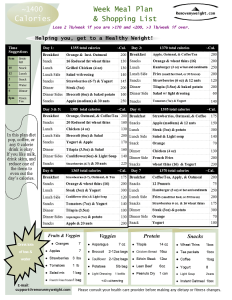 It is simple, downloadable, packed with the best/healthiest foods and printable. Please pay attention to your body’s signals, and stop if anything does not feel right. If you need more energy, add more fruit and vegetable calories as needed. Here’s what 1400 calories per day look like? To get a real idea of what it looks like to eat 1400 calories per day to lose weight, see the example plan below. You will eat three healthy meals and three healthy snacks each day. In addition, we provide you with a seven-day meal plan and shopping lists. Also, diet pop, coffee, or any other zero calorie beverage is okay. If you like milk, drink skim milk and reduce one of the items you eat, to even out the calorie count for the day. If you are currently under 150 pounds, you may need to switch to a lower calorie diet to see results, unless you are adding in more activity. See our Daily Calorie Needs Calculator or refer to our suggested daily diet chart to choose the best diet menu plan for you. Please comment below. We want to encourage you!